Frequently we are invited to weddings, anniversary parties, baby showers and all sorts of wonderful celebrations – beginning with a “Save the Date” notice. “Save the Date” notices for these blessed events, come to us (sometimes formally) to make sure we reserve the time. So much planning is put into celebrating these wonderful events, so much build up, so much celebration. It is important to carve out time so we can part of these special times. Have you ever put a “Save the Date” on the calendar JUST for you? For an important goal, just for you? Something monumental and personal – other than a wedding, or a graduation? Something special that takes as much time as planning for a wedding? Have you put a BIG goal on the calendar and truly carved out time to make it happen? Have you given a BIG goal the same commitment as planning for a wedding? Have you invited your family and friends to support you? Have you invited family and friends to celebrate with you? Have you followed through? Met your goal? Held a celebration? For those who have – good for you. I am truly impressed. For the other 99% who haven’t – you are not alone. Most people who set a goal – fall short of seeing it through. Most people do not put themselves on a self imposed timeline, outside of work or school or getting married. Do we not want something bad enough? Does it take too much time, too much effort? Are we easily distracted or derailed? Do we just give up too easily? There are a TON of reasons why we fall short…but it all boils down to this. But it all starts with… Commitment. We have to be fully committed to our goal, no matter what, or we will fall short. Our goal needs to be BIG enough to matter to us. If the goal is too small- we will find it too easy to discard – as not being important enough. Make your goal BIG enough and exciting enough to harness 100% commitment from you. We will give up when it gets too hard. We will cave to judgement. We will find reasons to stop, to quit. We will justify putting off the goal somehow, someway, to someday. We can put our goal above all else. We can have realistic, specific and measurable plans – daily. We can work those plans. We can make every day count. We can seek out positive support. We can avoid negative and distracting influences. We can listen to our body, mind and soul and feed it well. We can visualize, imagine and walk solidly towards our goal. We can get excited for every day we inch closer to our goal. We can believe in our goal. We can believe in our self. We can give our self grace – without giving up. We can plan a fitting “Save the Date” to celebrate – reaching our goal. Now the question is WILL you? 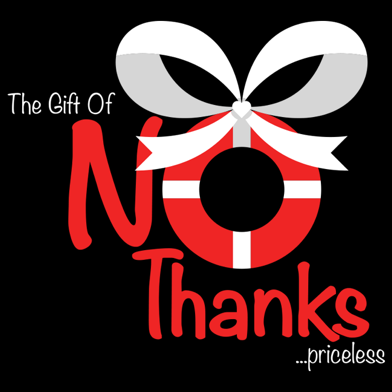 Saying “No thanks” to anything that stands in the way.